It's no secret that kids learn best through playing. I appreciate it when children's app developers introduce new and creative gameplay, and this is exactly what my app pick for today excels at. 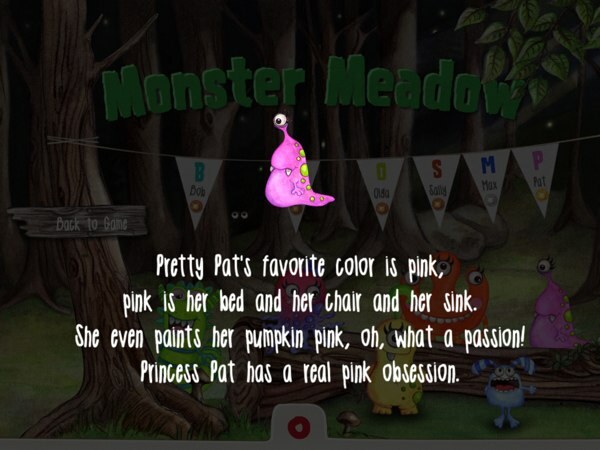 Monster ABC is a fun app for learning about letters and the initial sound of words. Monster ABC has three playing modes that increase in difficulty. 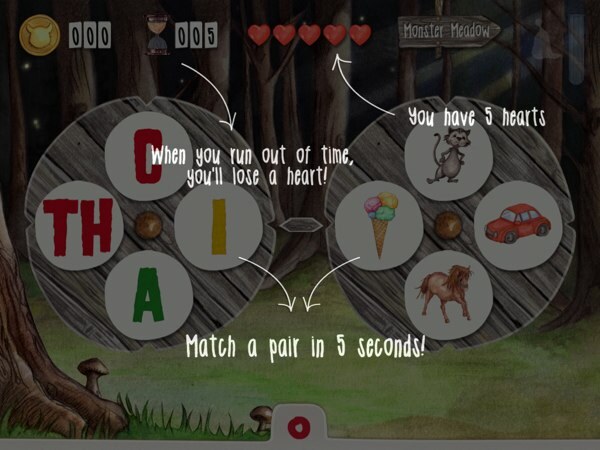 The easiest one, the learning mode, is the first one you play when you are only beginning the app. In the learning mode, two wheels will appear side by side. The left wheel is marked with four letters and the right one with four hand-drawn images. The idea here is to spin the wheels to match the letter to its adjacent image. If you're not sure what the image is, you can tap to hear a hint. When you have found a match, the game will remove the pair. You play until you have matched all four letters and images. Then, the game will refresh with two new wheels. The game starts with letters from A to Z, and moves on to initial sounds. An initial sound is the first sound of a word and is represented by a letter or a letter combination, for example, “sh” in the word “sheep” or “ch” in the word “chimpanzee”. Other examples of initial sounds include “qu”, “ph”, “th”, and “wh”. As you complete the learning mode, you can unlock adorable monsters and the other two game modes: Silver and Gold. These modes use the same gameplay, but a timer is thrown into the loop. In the Silver mode, for example, you try to find as many matching pairs as you can in 60 seconds. In the Gold mode, you try to find a pair before the clock runs out. You have five seconds initially, but each matched pair extends the timer a bit. You lose one heart every time you run out of time, and when all five hearts are gone the game is over. The game is suitable for juniors ages 3+ to learn phonics, initial sounds, and new vocabularies. The developers created a downloadable PDF containing all 31 initial sounds featured in this app. I'd suggest taking a look at it to see how the app may help your juniors. As the name suggests, Monster ABC uses a monster theme. There are six monsters you can collect in this game, four of which are unlocked by playing the learning mode. If you want to unlock the last two monsters, you have to play the Silver and Gold modes respectively. The app is available in both English and German. The English narration/voiceover is spoken with a British accent. While matching is a fairly common activity in children's apps, Monsters ABC uses a fun mechanism. Other apps usually ask kids to connect two columns of items by dragging and dropping or drawing a line. But Monster ABC lets kids spin wheels, which I personally find more interesting. I also like how parents can play cooperatively with their juniors in the app. This is because Monster ABC supports multi touch. So you can, for example, have your junior spin the image wheel while you turn the letter wheel. You can then swap roles as you play. Finally, I also like the fact that the monsters are an important part of the game. More than just rewards, these monsters will appear in the gameplay; for example, on the image wheel (thus requiring you to remember their names). They also have fun profiles with special rhymes. Monster ABC is a fun alphabet game for juniors ages 3+ to learn about letters and initial sounds. It features a unique gameplay where kids try to match letters and images by spinning wheels. It also comes with Silver and Gold modes, which are slightly more challenging and suitable for older juniors who want to refresh their skills.